Sert Metal, now a member of VESUVIUS Group, has long been a worldwide leader in the development, manufacture and marketing of high performance systems for the automation of casting processes of molten metal. Since 1965, Sert Metal has developed industrial systems and equipment for the improvement of metal flow control, on existing or new continuous casters (steel) or pouring machines (iron foundries), mostly by using stopper flow control. Sert Metal’s skills used to cover every main type of process related to pouring or casting of liquid metal. Now, since 2017, Sert Metal no longer promotes any systems for Foundry and the activity is focused on the Continuous Casting of Steel exclusively. Over the years working with steelworkers, Sert Metal has gained in-depth extensive knowledge in various caster types (billet, bloom, slab, H beam), in casting defects, argon flow control, metallurgy, temperature management, … and everything else that makes the day-to-day concern of a modern steel plant. Sert Metal sells complete automated turnkey solutions, specific products and assistance for its customers. Our goal is to help you do quality metal products, with maximum savings through world class automation. 1949 : founding of the company by Mr. Pierre PONCET (chemical engineer). Up to the middle of the 1960s: a general machine design and engineering consultancy, SERT acquires know-how in very varied fields including mechanical engineering, chemicals and electronics. Middle of the 1960s: contact with Creusot Loire, who were working on the first continuous casting machines. Start of research into controlling the level of molten metal. End of the 1960s: first industrial mould level control installed in Italy. During this period, SERT also produces the first machine for processing polyethylene for coating telephone repeaters for under-sea cables (with CIT, later to become CIT-Alcatel). From the middle of the 1970s: Process of continuous casting of steel develops and thus the need for automatic mould level control increases. SERT has a share in this, but only with modest sales activity. It continues its research in different fields. Middle of the 1980s: SERT is restructured and refocuses its activity on metal casting control. 1990: SERT is bought by five of its managers. This restructuring is characterized by an increase in sales effort as well as research and development in the field of metal casting. 2002: SERT becomes a limited liability company with capital of €300,000 and employs 30 people. 2007 : Agreement with the company AVEMIS, specialized in eddy-current technology. AVEMIS electromagnetic sensor comes to complete SERT key range for continuous casters with a complete loop for mould level control. 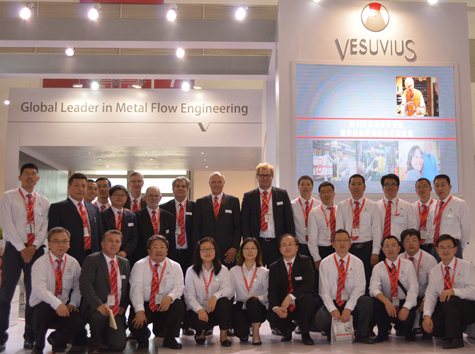 Dec.2011: SERT METAL and AVEMIS both become members of VESUVIUS Group, Global Leader in Metal Flow Engineering. 2017: Systems for Foundry are no longer promoted. Focus on Iron&Steel (VESUVIUS Flow Control division). 2018: SERT and AVEMIS are gathered into a new division: Flow Control Digital Services division, with a focus to further develop value-added services around the tundish and the mould in the continuous casting part of the steel process.